The history of the Koi. There is a lot of information available on koi history and they don’t all agree on when koi were first introduced. One of the reasons is because there is a problem with translations. The word koi in Japanese means carp and there are many varieties of carp. Nishikigoi means brocaded carp and those are the beautiful fish we enjoy today. Magoi is the Japanese word for the common black carp (Cyprinus carpio) and this is the fish that all Nishikigoi descended from. Goi also means carp in Japanese but it is only used correctly when tagged onto the end of a word such as Nishikigoi, Kigoi, Midorigoi, etc. Most everyone involved in this hobby refer to the Nishikigoi as just Koi. So, when you find information relating to Koi in Japan dating back to 200 BC that is when the invading Chinese brought the common black carp to Japan. The statement “Contrary to common belief Koi did not originate in Japan” is true if you are referring to the common carp but not true when referring to Nishikigoi. Rice farmers of Yamakoshigo, a village in the Niigata prefecture on the northwestern coast of mainland Japan, started raising carp in the ponds used to irrigate their rice paddies to use as a protein supplement to their rice diet. 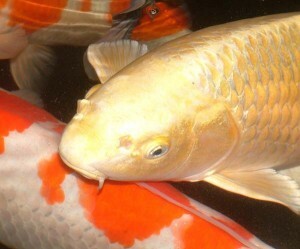 Even though there are some very old paintings showing carp with color mutations such as red fins it wasn’t until the beginning of the 19th century that rice farmers in the Niigata prefecture began to collect and breed carp with color mutations of red, white and yellow. The Japanese use the reign of their emperors when referring to historical events. This is also true of the development of Nishikigoi. Bunka and Bunsei Era (1804-1829): During this era the first koi with red were produced in Japan. At first, their red markings appeared on their cheeks. White koi were also produced and crossed with the koi that had red cheeks. The end result was white koi with red abdomens. Tenpo Era (1830-1843): Breeding efforts continued to strive for change that would make the koi more appealing to the eye. White Koi with red located on the forehead was referred to as Zukinkaburi. Red covering the entire head was called Menkaburi, red on the lips only was Kuchibeni (lipstick). Meija Era (1868-1912): This is the era when the Kohaku were developed. This is also the era when carp from Germany were first introduced to Japan and bred with the Nishikigoi. This is where the Doitsu (German) varieties come from. There are two types of German carp. One type has no scales and is called the leather carp and the other has large scales along each side of the dorsal fin and along the lateral line only (mirror carp). Taisho Era (1912-1926): This is when the Taisho Sanke was perfected. It is a white koi with a red and black pattern. Sanke means tri-colored. Sanke may have appeared at the end of the Meija Era. Shiro Utsuri (black with white markings) was introduced at the end of this era. In 1914 some of the most beautiful varieties were shown at an exposition in Tokyo where some of these colored carp were presented to Crown Prince Hirohito. This is where it really got started. Showa Era (1927-1989): Showa Sanshoku (sanshoku also means tri-colored). This is the last of the varieties referred to as Gosanke (the big three) which includes the Kohaku, Sanke, and Showa. These are the three varieties of koi most prized by the Japanese and advanced koi hobbyist all over the world with the Kohaku being #1. These varieties are the ones that win most of the top prizes in koi shows. "When I operated a fish farm in Florida, I brought in many thousands of Koi from Japan and started breeding koi for the first time in any warm climate. Eventually those koi were the seed stock for koi bred in England and many other parts of the western world, and they were introduced slowly to aquarium shops throughout Europe and the Western Hemisphere." According to my calculations this was in the early 1950s. Heisei Era (1989-Present): The hobby continues to grow and I’m just thrilled at the prospects!